"I was leading a medical mission and we stopped into an orphanage in Ferrier, Haiti to visit the children. During a tour of the facility, a very polite and friendly young man introduced himself simply as "Roro." Roro explained that he'd been living at the orphanage since the age of twelve after his mother passed away. Even in that first conversation, Roro shared his dream of becoming a doctor one day so that he could help others. He couldn't shake the memory of a time when his own mother was in the hospital fighting for her life, yet there was no medical care to be found. This encounter with Roro left a lasting impression on me and my heart, and I knew there was something special about that young man." Over the years, Jennifer and Roro stayed in touch through email and Facebook, and it was evident that Roro's dream never changed. More so, that he had the motivation to make it come true. 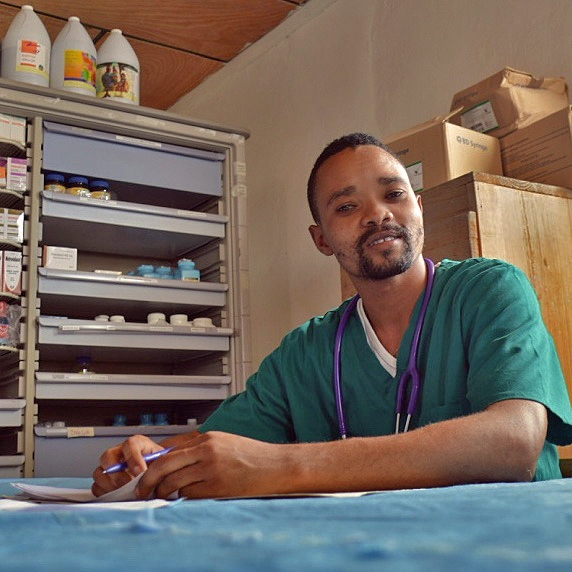 Through the blessing of a financial sponsor in the U.S., Roro was able to attend medical school. 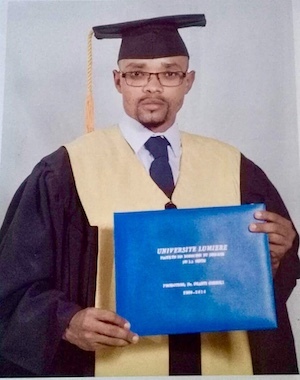 On December 21, 2016, Roro graduated from the Universite Lumiere in Port au Prince, Haiti with his medical degree. In Haiti, the Ministry of Health requires new physicians to volunteer for one year post-graduation in medical facilities across Haiti, after which point they can be hired. Roro will finish his year of volunteering in February 2018 and he's expressed interest in becoming a more integral part of the Espwa Foundation's medical relief work in Haiti. We fully support him coming on board, but need your help in making it happen! A Haitian physician typically earns $600 per month ($7,200 per year) working as a medical provider. Through this fundraising effort, we hope to cover his salary for the first year. Would you consider making a recurring or one-time donation so that Roro can continue serving his patients and following his dreams? Throughout the years, Paul "Roro" Rodlin served our Espwa medical teams as a translator. In the translator role, Roro did an exemplary job translating critical medical information between patients and non-Creole speaking providers. In March 2017, Roro, now a physician, joined another Espwa medical team: this time seeing patients and providing medical care. What an honor to have him as part of our team fighting disease and illness. On that trip, we treated over 600 patients. Roro now serves at St. Anthony's Clinic, where he always has a smile on his face and continues to go above and beyond in helping those around him. Being a new graduate and filled with enthusiasm and ideas, he has a passion for education and disease prevention. His patients appreciate his work ethic and kindness. John Rumcik 02/20/2018 $400.00 Happy Birthday Jen! Good Luck Dr. Roro! Amy Fisher 02/11/2018 $25.00 To my friend Jennifer and thank you for all of your hard work and dedication to this project!